Siri may have set the digital assistant craze into overdrive when it was released as part of the iPhone 4s back in 2011, but since then, Apple’s offering has struggled to stretch out a lead over the competition that has followed it. Google’s Assistant, Microsoft’s Cortana and Amazon’s Alexa are generally believed to offer better, more accurate experiences and Siri itself has, for many, been consigned to the pile of innovations that promised so much but unfortunately delivered little. That isn’t how everyone feels though, and while everyone around him waxed lyrical about the capabilities of Google Assistant, Matt Birchler wasn’t quite seeing the magic himself. An iPhone user who went all in on Android for a number of weeks, Birchler put together a video showing how both Siri and Google Assistant fared when asked the same series of fifty questions. The results are played out on a video Birchler posted to YouTube, and as things turned out, Siri actually did better than you might expect. I have been using Siri for years, and have been going 100% in on Android over the last few weeks and have given Google Assistant a solid effort. My experience has been a little different than the popular narrative. 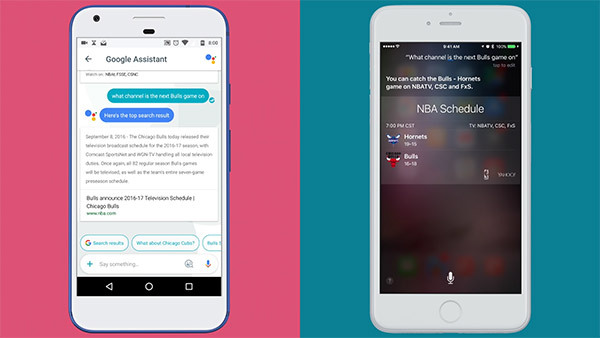 Throughout the fully ten-minute video, Birchler outlines the questions that were asked and shows both Siri and Google Assistant attempt to come up with a relevant response. Both managed to come up with some impressive answers at times, depending on the question being asked, and both struggled with certain questions and requests that could be argued as something they should be capable of handling without too many issues. Check the video out and see how it tallies with your own experience of Siri and Google Assistant. We have a feeling that everyone experiences the two assistants differently, depending on context etc, but if there’s one thing this video confirms for us, it’s that unlike the popular opinion, Google hasn’t sewn things up with Assistant just yet. This article is valid for US only.Non-US resident will be still have dumb answer and even can’t talk in local language for Siri. apple make more local language please. He used the Google Assistant available Allo because he said he didn’t have a Pixel. His very first question was “What’s my schedule look like today?” which failed to produce a result. If you have a Pixel go ahead and ask that same question. Guess what? no problem. Assistant in Allo is gimped. Please rename Allo vs Siri.